I am Cheryl and I live in Canlubang, Calamba City. After I graduated from Anihan, I was hired by Tagaytay Highlands International Golf Club, Inc. which is where I also did my on-the-job-training (OJT) for four months. After a year and a half there, my executive chef transferred me to Highlands Steakhouse by Tagaytay Highlands (SM Mall of Asia). He said, Alam kong kaya mo kahit nag-iisang babae ka (I know you’ll be able to handle it even if you’ll be the only girl there). My executive chef and sous chef were very supportive. They let me borrow their books, they shared all their knowledge and trusted me in everything I did, especially in making the market list and the production summary. Though my duties are very hard, nagagawa ko pa rin ito ng tama at sa oras (I am able to do them well and on time). Anihan taught me to “love what you’re doing and offer it up to God!”, to always have a passion for great things. Nakatanim na nga yata sa isip ko yung (I think these words are already planted in my brain), "OK, girls, this is it! Tutoong mundo na ito (This is the real world)!". Every time I remember those words, I remember Anihan. The school always reminds me of my friends, teachers, tutors, and… virtues like sanctification of work, good attitude towards work, harmony with co-workers, and giving importance to my family. Anihan taught me a lot of great things and I’m very thankful because, at last, ako na ito (this is me)! 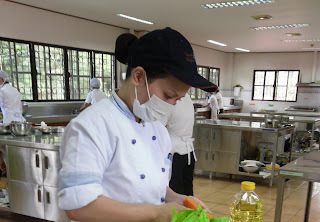 A person who loves cooking, eating, and at the same time, teaching people (co-workers and on-the-job-trainees) to do the things they love… I am proud to say, ako na ito, a person with passion for work and sense of direction. To show my debt of gratitude, I am applying as a part-time instructor in commercial cooking at my alma mater… I want to teach (other) young women all the things I’ve learned in the industry where I am right now.